Scooper - Technology News: How can we help kids protect themselves online? We are living in a renaissance period of new digital media and technologies that are reshaping the world around us. A wide and growing cross-section of the world’s population has become immersed in this hyperconnected digital world, in turn transforming the ways we communicate and interact. At the same time, as digital media and technology become an indispensable part of our daily lives, there is growing concern that we are losing control as our dependence on technology grows. One key issue concerns the unprecedented scale and scope of online personal data that is being generated, collected, analysed and monetized, often beyond user awareness or control. In a recent survey of over 6,000 digital media users worldwide, the World Economic Forum found that 52-71% of respondents believe ICT companies and digital media platforms are not doing enough to provide adequate end-user control over what personal information is shared online. Numerous privacy scandals and data breaches have occurred and further hurt public perception of the Industry. Governments are also struggling to regulate the appropriate usage of users’ personal data and develop robust standards for data protection. As a result, the public’s trust in government and digital-media-related industries is volatile and wavering. Tackling this problem is a high priority to ensure sustainable growth of this industry sector and to continue developing the digital economy over the long term. How can we close this trust gap? Trust comes from understanding and knowledge. Digital intelligence, or DQ as it's also known, is a set of collective abilities to meet the demands and challenges of digital lives, including digital citizenship and literacy skills. The starting point is for individuals to be aware of how their online personal data is being collected and used, and to understand its impact on their lives. Unfortunately, such DQ is not currently very high among the public. According to the survey, 32-47% of respondents did not understand the meaning of "online presence" and "derived data", even after they read their definitions. It is clearly important to address this gap in understanding and equip people with the skills to use digital media and technology responsibly. Unfortunately, children are the most vulnerable and critical group in society regarding digital issues. Many children do not own their privacy even before their digital lives start, which can be the day they are born, and they are not properly equipped to manage their privacy afterwards. Their personal information, such as photos or medical and educational information, is shared online by their own parents, who often do not realize the full implications of their actions. In other cases, child information is included in the cloud by societal systems with blind understanding of the consequences. Already more than 90% of young people between the ages of six and 17 access the internet across Europe, according to the OECD data. More than 50% of children use social media by the age of 10 . And nearly all children who participate in digital media and share information do so without understanding what it means for their privacy . As well as this, early digital media use increases the likelihood of being exposed to a variety of online risks, such as screen addiction, cyber-bullying, online sexual behaviour and cybercrime. Just as young people need to learn the highway code before driving a car, children need digital education before they can safely navigate the online world on their own. 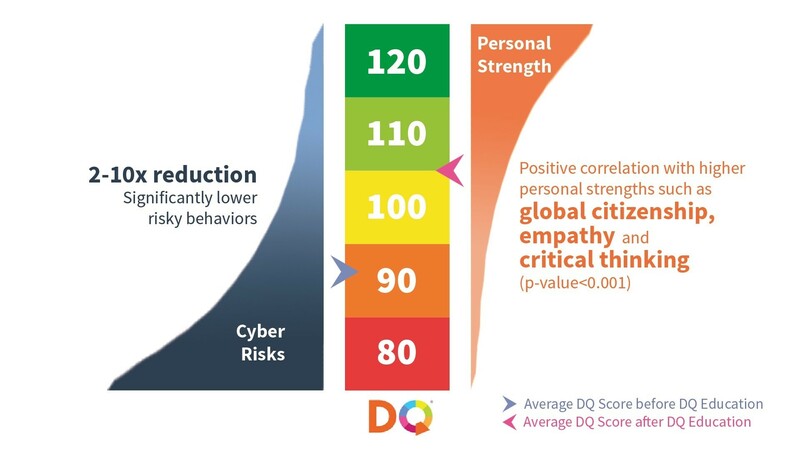 A 2016 study by Nanyang Technological University showed that higher levels of digital literacy are significantly correlated with a lower risk of becoming involved in potentially harmful behaviours, as well as with necessary skills such as global citizenship, empathy and critical thinking. Given the pressing nature of the issues, national governments and industries need to work together with other involved parties, including academia and civil society, with speed, scale and influence. Governments need to prioritize digital education as a key agenda item, with the support of civil society and academia. Industries need to increase the transparency and accountability of users’ privacy and safety, and partner with governments to implement digital educational programmes, as well as incorporate digital learning tools in their products and services. An informed and responsible digital population, together with transparent governments and industry, will promote a culture of trust. This trust will play a pivotal role in the long-term development of an enduring and innovative digital economy.